This jersey features a tailored fit designed for movement. The NFL Game Jersey: Stay true to your team all day, every day, game day. The no-tag neck label offers clean comfort. Screen-print numbers provide a light and soft feel. STAY TRUE TO YOUR TEAM ALL DAY, EVERY DAY, GAME DAY. Rep your favourite team and player any time in the NFL Pittsburgh Steelers Game Jersey, inspired by what they&apos;re wearing on the field and designed for total comfort. Free standard delivery on orders over 800 LEI. Standard deliveries arrive in 2–3 days; we deliver 6 days a week. Have your say. 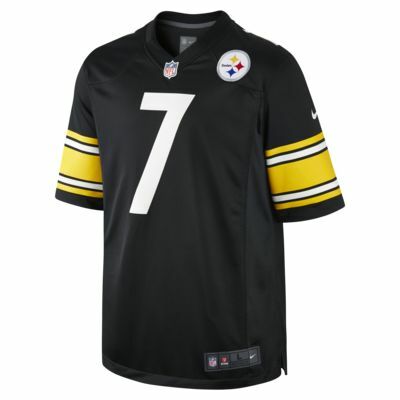 Be the first to review the NFL Pittsburgh Steelers American Football Game Jersey (Ben Roethlisberger) .